By Eric Guel on January 25, 2011 Visit Eric's Website. A seasoned bird slaughtering veteran was over at our little homestead a few months ago, showing us how to slaughter ducks. After processing a few birds he started to talk about other breeds of poultry, zeroing in on the mutha’ of all meat birds—the Cornish Cross. 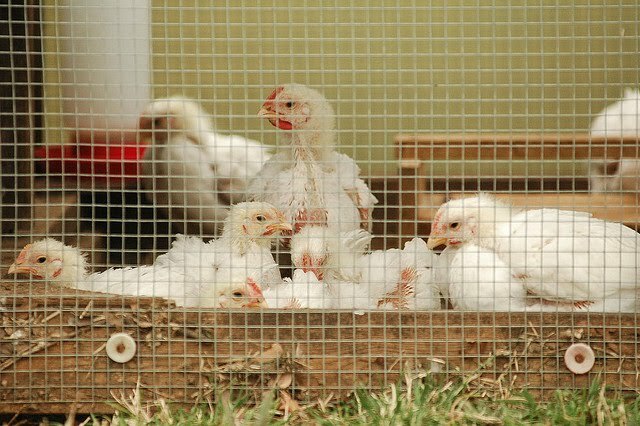 These lovable little fat guys are also known as broilers or Cornish-Rocks. From what I understand, they’re an American invention, intended solely to feed the masses in a proficient and highly profitable way. Before the Cornish Cross came on the scene several decades ago, meat birds took about 12 weeks on average to mature to slaughterable age; hence, good chicken meat was more of a rarity. But now, thanks to our chunky friend, meat birds can be ready to harvest in only 6 to 8 weeks! Not sure if you’d like them? Chances are if you’ve eaten at KFC, or if you’ve had a chicken sandwich from McDonald’s, or simply bought a raw bird from the supermarket, it was some sort of Cornish Cross/Cornish-Rock variety. These birds are kind of like crack cocaine: one size fits all palates. So … if you don’t want to get addicted, then you better not pick up the rock in the first place. But chances are you’ve already savored juicy bird flesh multiple times, so there’s no turning back. You’re a carnivore. Heck, it’s better than being addicted to narcotics. “Oh really?” I replied … suddenly feeling a wee bit hungry. “I suppose so,” I mumbled … or was that my stomach growling? “I don’t want to have anything to do with those chickens again,” he summarily pontificated. “Uh huh,” I said. In reality, I wasn’t paying attention anymore. I was thinking about fried chicken. They don’t have souls (I’ve been told). They can get so fat so quickly that their legs break. They’re not good at foraging for food, so you pretty much have to give them feed. They won’t reproduce this side of being incubated in a laboratory filled with nerds in white coats. So unless you own a white coat, a laboratory, and you’re a nerd, you’ll have to order them from a hatchery every time you want to raise them. Unlike parrots, they can’t learn to talk. Truth be told, they’re not hard to raise. But if you’re going for sustainability, you’ll do better to look elsewhere. They sure are tasty, though. Nope, don’t eat at KFC or McDonald’s, can’t stand the stuff. I do plead guilty to an occasional cup of black coffee at McDonald’s, though. My husband gets the “senior” size, but I’m too young, LOL. I have raised the Cornish Cross in the past, my grandkids refer to them as the “chicken nuggets”, as opposed to my laying hens. I haven’t had a problem with legs or with them getting too heavy because I don’t follow the “rules”. I give them 18% chick starter, never have found that high protein broiler stuff, although I did find 21% here once. Just once. I give them chicken starter until they reach 7 or 8 weeks when we slaughter. Hens are typically 6 or 7 pounds, roosters more like 8. They all grow just fine, I’ve never had a broken leg and only one heart attack victim when the dog barked at one and scared the poor creature into heart failure. Mortality is extremely low and I have to give a big pat on the back to Townline Hatchery, their chicks act like chickens, scratching and pecking and doing chicken like things instead of sitting in front of the feeders like lumps. So far my chick mortality with their birds has been an amazing 0%, everyone I’ve ever gotten from them of any variety has survived, but they are in Michigan and so am I, so I’m thinking shipping may be less stressful. Their CornishX has not had a problem with splayed legs or other muscular/skeletal issue and I put their food at one end of the pen and their water at the other so they have to walk around. They even chase bugs, like “normal” chickens. They do pasture well, but I have to supplement the feed and I don’t let them “free range” because they are too fat and slow to escape the neighbor’s dog. Instead they move from green spot to green spot, fertilizing as they go. I admit that their abnormally fast growth makes me a bit nervous, it’s just not “right”, but the kids always want to grow some more. While I’m happy taking a bit more time and just raising Barred Rock or Brahma roosters, our family is more impatient and want that nearly instant gratification of a freezer full of birds. So if I *don’t* like KFC, or McDonald’s, I’ll do better elsewhere, too. Thanks for this article though. I enjoyed it!